For those of you confused about the dates in the BTTF movies see my update below. Back To The Future first arrived on cinema screens 25 years ago. When I was a boy, most kids wanted to be Michael Jordan, or the President, or maybe an astronaut. I wanted to be Doctor Emmett L. Brown. He was the wonderful scientist-of-all-trades in 1985’s Back to The Future, played by the inimitable Christopher Lloyd in what has been, thus far, his finest role on the screen. I doubt he or anyone else will ever top it. As a child, I didn’t want to be a scientist, I wanted to be that scientist. Doc Brown just knew stuff about pretty much everything, and while being a little scatter-brained (with the knowledge of real, working, time travel in their head, who wouldn’t be?) was unquestionably brilliant, if not a little short-sighted. Back To The Future released 3 July, 1985. I was barely two years old at the time, so I never got to see it in the theater. Later, though, it became my favorite movie. Over the last 20 years I’ve watched the trilogy dozens of times. Though they are very much a product of the 1980s, and the fashions looks silly to us now, the films themselves never get old, and Doc never becomes less inspirational to me. ” If you put your mind to it, you can accomplish anything.” It’s a platitude, sure, but but coming from a guy who invented a time machine, it means a lot. 20 years since I personally first saw the the original BTTF film, am I any closer to mad scientistry? My business card says so, but I doubt I’ll ever reach Doc’s level. Part of Doc’s appeal was that he was this platonic ideal of the Mad Scientist that existed in my mind, even before I knew it was there. Like Peter Cushing’s portrayal of Van Helsing in the half-dozen Hammer-produced Dracula films, or Kevin Conroy’s voicing of Batman in the mid-90s Batman: The Animated Series, Lloyd’s Doc Brown took up residence in my headspace and will probably never leave. At least, I hope he won’t. 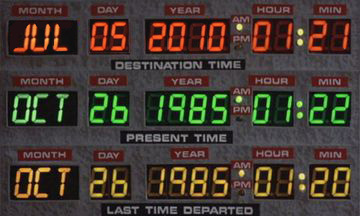 Update: In the BTTF film the time travel event takes place on October 25th, 1985. In BTTF 2 Marty goes to October 21st, 2015. BTTF was released July 3rd, 1985. 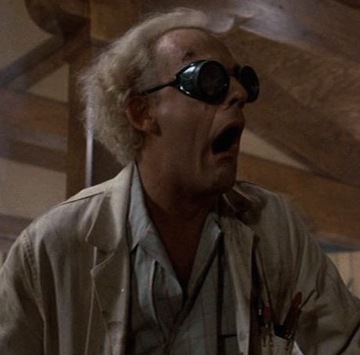 For those wondering, as topherchris was, “how July 5, 2010 fits into this,” the Back To The Future DVD commentary: In it, Bob Zemeckis and Bob Gale (the director and co-writer of the film) explain that they put this in there as a sight gag, since July 5th was around when the movie was going to come out. It exists only as a little joke for keen-eyed viewers. Apparently it doesn’t. Update 2: The original version of this post misused quotation marks around “25 years,” which has been fixed. Update 3: It looks like the July 5th, 2010 screen shot is actually a hoax.